Watch this stop-motion tribute to our favorite fearless feminist from Diana Gabaldon's Outlander. Diana Gabaldon’s beloved novel Outlander opens in 1945 on the Scottish Highlands. Former British combat nurse Claire Randall returns from the war and is finally reunited with her husband when she walks through a standing stone in one of the ancient circles that dot the British Isles. Suddenly she is a Sassenach—an “outlander”—in a Scotland torn by war and raiding clans in the year 1743. Claire is catapulted into the intrigues of a world that threatens her life, and may shatter her heart. Marooned amid danger, passion, and violence, Claire learns her only chance of safety lies in Jamie Fraser, a gallant young Scots warrior. What begins in compulsion becomes urgent need, and Claire finds herself torn between two very different men, in two irreconcilable lives. Claire remains one of our absolute favorite characters from literature. Check out our stop-motion animation of this kick-a** character, below. Which character would you like to see us immortalize in felt next? Leave a comment below and let us know—they might end up in a future Papercuts episode! 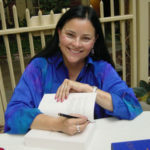 DIANA GABALDON is the #1 New York Times bestselling author of the wildly popular Outlander novels—Outlander, Dragonfly in Amber, Voyager, Drums of Autumn, The Fiery Cross, A Breath of Snow and Ashes (for which she won a Quill Award and the Corine International Book Prize), An Echo in the Bone,and Written in My Own Heart’s Blood—as well as the related Lord John Grey books Lord John and the Private Matter, Lord John and the Brotherhood of the Blade, Lord John and the Hand of Devils, and The Scottish Prisoner; two works of nonfiction, The Outlandish Companion, Volumes 1 and 2; the Outlander graphic novel The Exile; and The Official Outlander Coloring Book. She lives in Scottsdale, Arizona, with her husband.